My grill is fired up and I have started poking things with sticks. Yes, this woman isn’t afraid to slap some food on the Barbie especially because grilling is a healthy way to cook (versus deep fried). Also, I find that it is faster and easier to clean up versus using my kitchen. This recipe is a keeper because while it took a while to stick everything on the skewer – it cooked in about 4 minutes. That is what I call fast food. My kids loved these and we didn’t have any leftovers. The marinade gives a nice salty, spicy, gingery kick to the shrimp. Also, grilled pineapple is divine! I used fresh pineapple which is on sale right now and is key to having the pineapple be firm enough to stay on a stick. I don’t think canned pineapple will work here. 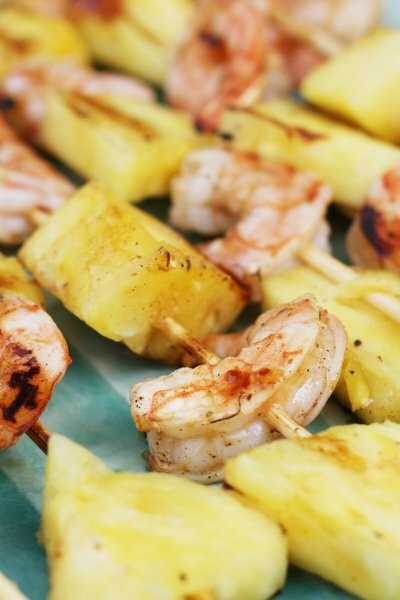 Mix peeled shrimp in the marinade in a medium bowl while you slice the pineapple. It is ideal to marinate the shrimp for 30 minutes (in the refrigerator) but if you don’t have the time, don’t worry about it. 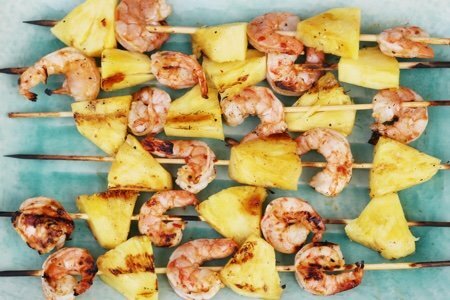 Using skewer sticks alternate between the pineapple chunks and the shrimp until you have strung three of each. Heat grill to high and place the skewers on for about 2 minutes and flip. Cook until shrimp is bright pink and serve immediately. Is there another fruit that could be substituted for the pineapple? I personally love it but the rest of my family unfortunatley does not, is there anything else that grills well that would go with the shrimp? Caryn, grilled mango and shrimp is delicious. How 'bout using a George Forman grill? 2 min and done-faster fast food! Nice pineapple video, but i have a pineapple coring cutting gadget that does aLl in a Minute. Amazon sells them. My daughter uses it often. Also love zucchini jalapeño poppers. A big hit! Use fresh jalapeños and chive-onion cream cheese for even more fun.